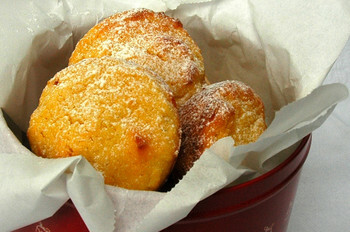 These little cakes started out life with Tanna as Lemon Cornmeal Cake . Tanna's cake is spectacularly baked in a rose Bundt pan. With only three of us in the house we would be very fat if we ate cakes like this every day. It is much easier to freeze muffin shaped cakes than a slice of Bundt pan shaped cake.....and they would cook in 20 minutes and we could eat them so much sooner. With the ingredients I had in the cupboard I played around with the original recipe Tanna had used by Trish Boyle from the Cake Book. This size is perfect to enjoy with a cup of tea mid morning or maybe mid afternoon or maybe after dinner. Preheat oven to 180C or 350F. Grease and flour 2 x 12 muffin pans. Mix together flour, cornmeal, sugar, baking powder & salt. Add sour cream, whisk until combined. Add melted butter and blend. Add vanilla and Grand Marnier and mix until combined. Fold wet ingredients into dry until just blended. Bake 20 minutes or until tops ares lightly golden and toothpick inserted comes out clean. Cool on wire rack and serve dusted with icing sugar.